Located in Orchard Park, New York, Ralph Wilson Stadium serves as home to the Buffalo Bills. It opened in 1973, originally by the name of Roch Stadium, but was later renamed in 1988 after the current owner Ralph Wilson in 2014. The naming rights to the stadium were originally owned by Rich Products, a food products company in Buffalo that paid $2.5 million to retain the rights for 25 years. The measure was approved by a 16 to 4 vote, despite a matching bid from owner Ralph Wilson to name the stadium Buffalo Bills Stadium. The stadium was named Rich Stadium and was one of the first naming rights stadium deals of its kind in national sports. Due to its location next to Lake Erie, it tends to be extremely windy, and is known as one of the most difficult stadiums for kickers. The low, compressed design of the stadiums seems to only add to the wind’s impact. Since its inception in 1973, the Buffalo Bills have beaten every NFL team at Ralph Wilson stadium at least once, and currently hold an undefeated home record against the Green Bay Packers, Baltimore Ravens, Arizona Cardinals, and the Tampa Bay Buccaneers. 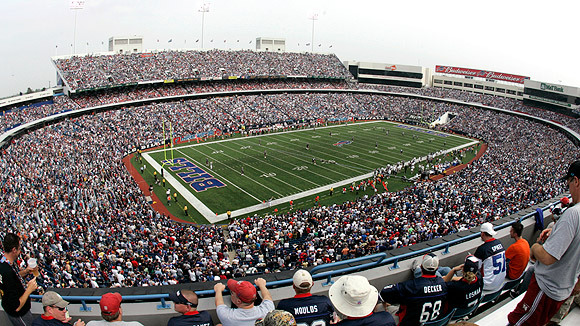 Ralph Wilson stadium currently seats 71,870 and is an open air venue. It’s featured AstroTurf as its playing service since its opening in 1973. • In 1971, owner Ralph Wilson began taking calls about potentially relocating the team, particularly from Seattle, as well as Memphis and Tampa also expressing interest. This worked to speed up and force Buffalo’s hand into building a new stadium for the Bills. • In 1984 the stadium saw its first renovations by increasing the capacity to 80,290 and adding 16 new executive suites. Years later, in 1992, they added another 24 suites to the section. • On January 1st of 1989, the stadium featured its first NFL Playoff game with the Bills defeating the Houston Oilers by a final score of 17-10. • In 1998, the stadium had renovations done at a price of $57 million which included adding some luxury and club suites to the stadium. • In 2011 the Bills changed their playing surface from AstroTurf to A-Turf Titan, which is produced by a company located in Western New York.